SARA GAMA, GOLDEN BALL IN CRUISE! 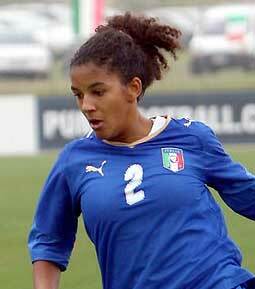 Sara Gama was elected "Golden Ball of Italian 2010-2011": defender of Chiasiellis and supporting column of the Italian National team, has beaten the opponents in this special ranking. So it was important news regarding "Calcio in Cruises", because it was Sara who completed the pack of the players who boarded the ship during the 5 women's soccer tournament on the cruise, as a further "Special guest", to complete in fact a supporting axis that already sees the presence of the goalkeeper Sara Penzo of Venice and the attacker Simona Sodini of Turin. Sara Gama wins the Golden Ball after the last two seasons in a row went to Melania Gabbiadini. The news was made official by Luca Pisinicca, on RAI SPORT 2, at the end of the opening match of the Under-European 19 won by Italy against Russia for 2-1. Read more: SARA GAMA, GOLDEN PALLET IN CRUISE! Our athletes, who so far have not betrayed us with the votes, can continue to vote for the Best Companies of each category - up for grabs 1 software each put up for grabs by FMR CALCIO - www.fmrbg.com. The strong defender of the Chiasiellis and irremovable column of the National Major she was elected Italian Golden Ball 2010-2011 and it happens to the encore of Melania Gabbiadini. The news has been formalized today by Luca Pisinicca, its RAI SPORT 2, at the end of the opening match ofEuropean Under 19 won by Italy against Russia for 2-1. Sara Gama will be busy until the 3 June with the Italian National team to dispute the friendly against Germany, before the start of the World Championship "Germany 2011"I announced the news to Sara Gama via cell phone and was satisfied with the newly acquired recognition, a brief interview tomorrow! 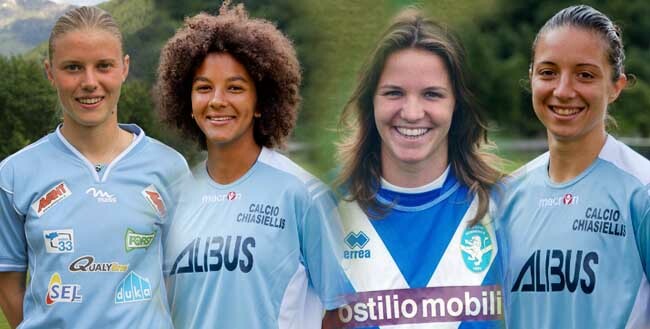 Recall that Sara Gama (89) was part of the team that in the 2008 brought to Italy the first title of CHAMPION OF EUROPE. The award ceremony and delivery of the Italian Golden Ball will be carried out during the Mediterranean cruise organized by "football on the cruise"www.calcioincrociera.it to which Sara Gama is the guest of honor along with the two godmothers of the event Simona Sodini and Sara Penzo. On the occasion of the resumption of the Italian Cup final of the 28 May in Gallipoli between Torres and Tavagnacco, Luca Pisinicca and Katia Serra will flash the Golden Girls and inform the viewers, the names of the players nominated, with the popular votes cast on the site official of the event, to compete for the "stronger player by role"and to the election of the "2010-2011 Italian Golden Ball"
The jurors will have to vote for 5 kickers for each role and to elect the GOLDEN BALL who will win the fabulous cruise organized by "football on the cruise". Stronger knitting machines for the role, voting open! Golden Girls Award - the voting is open to name the "strongest players for the role", companies, press officers and Mister of the category A series! You can already vote even the strongest clubs of all the national championship categories (they also include the spring teams) and in the next days voting for the A2 and B series players will be available. How is this edition held? easy! the first 5 most voted players for each role and category will be nominated for the final evaluation that will be submitted to a technical jury that followed the players during the championships. The juries will be announced at defined nominations. Read more: Stronger knitting machines for the role, voting open!